Read more about the Design Lab. 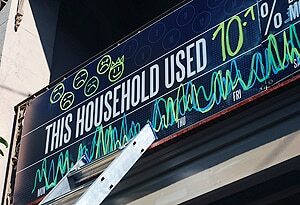 Five households were fitted with exterior blackboards that publically displayed the residents' daily electricity consumption. An applied design research project that aims to reduce domestic electricity consumption has proposed that self-awareness and self-exposure may be the key to reducing energy usage. The project was devised by Dr Martin Tomitsch and Dr Andrew Vande Moere from the Design Lab in the Faculty of Architecture, Design and Planning at the University of Sydney. Both researchers focus on the urban environment as a real-world context to investigate how they can design interactive technology to encourage a more sustainable way of living. In this project, five households in a street in Darlington, Sydney, were fitted with a large exterior blackboard that publically displayed the residents' daily electricity consumption. The blackboards outside the homes acted as a sort of scoreboard of their daily energy saving performance, compared relatively to the other households in the street. Inside the homes, a small blackboard with a digital display monitor presented daily kilowatt usage which, enabled residents to keep tabs on their usage, with the blackboard enabling them to interact and write notes to themselves about their usage. The idea behind this is firstly that direct feedback on energy usage is crucial to enable people tomonitor their behaviour - in terms of electricity usage - and to alter it to reduce consumption. Secondly, exposing the information publically outside the home means that healthy forms of comparison and potentially competition can arise between neighbours, with the result being a greater motivation in reducing one's energy usage. 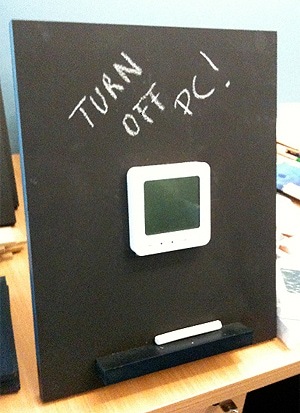 In each house, a small blackboard with a digital display monitor presented daily kilowatt usage. "While commercially available energy monitors which show the energy consumption per appliance or household can already provide the exact, numerical information, it can be difficult for people to engage with the actual meaning of the numbers displayed on such monitors." Dr Tomitsch says. "In addition, there is often a lack of motivation to change one's behaviour regarding energy consumption, let alone a social context in which behaviours of energy usage are encouraged." Dr Martin Tomitsch and Dr Andrew Vande Moere teach in the Bachelor of Design Computing and the Master of Interaction Design & Electronic Arts (M.IDEA). These are unique degrees that combine the creativity of design with the practical and technical knowledge of computing. These programs focus on the creative, technical and aesthetic possibilities of computer-based design through the study of design, programming, interaction and modelling. The Darlington project has been running for seven weeks and finishes this week with the results to be published next year. The project was funded by the Sustainability Cluster within the Faculty of Architecture, Design and Planning.